A collection of various stories by Suehiro Maruo. NOTE this review ONLY covers the FIRST CHAPTER of Lunatic Lover's, the second chapter is only 16 pages long and doesn't make much sense, and the rest are COMPLETELY UNTRANSLATED. 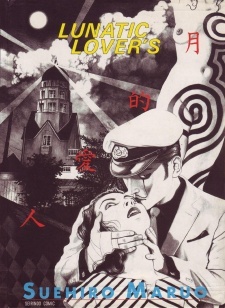 As the title states (Lunatic Lover's), this manga is NOT about Lovers. This manga is about a teenage boy who is mind-fucked. This manga is freakishly weird, even to my standards. The story of a boy who's father is dead, and he feels something is missing in his life without it, although he won't admit it. And because of this, he refuses to eat and ends up starving himself physically and mentally to the brink of absolute insanity. He is a necrophile who has frequent visits from his late father and deceased ancestors, and believes that they are telling him to do illogical and irrational things, but he does them anyway because his 'real' father isn't there to guide him.